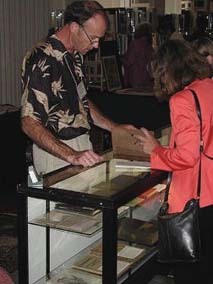 On September 28, a typically sunny and beautiful early autumn day, the 9th Annual Book Fair sponsored by the Central Valley Antiquarian Booksellers Association (CVABA) was held in Sacramento, California. Among the 54 booksellers participating were 3 IOBA members: Vic Zoschak of Tavistock Books in Alamada, CA; Michael Greenbaum of Janus Books in Tucson, AZ and Chris Volk & Shep Iiams of Bookfever.com in Ione, CA. 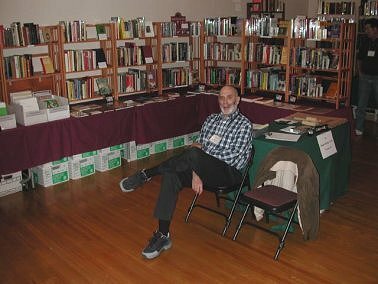 Once again, Bill Ewald of Argus Books, Sacramento, the Fair Director who has been running these shows for the past 9 years, did a great job of putting on a well-organized – and more importantly – a well-attended show. Set up was on Friday afternoon preceding the show, and included in the cost of the booth rental is a varied and very good buffet dinner, with hungry booksellers lining up for supper as soon as the food appeared. 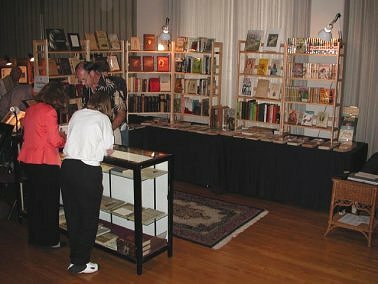 In addition to the free meal (which also provides a chance to chat with other sellers), among the features which make this show especially worthwhile for a bookseller are the generous booth sizes, the relatively reasonable cost for renting a booth, and the ability to send out an unlimited number of free passes without having to buy the passes up front. Unlike many shows which limit the number of free passes or charge the booksellers for them, the passes you receive for this show are coded by bookseller and you are only charged (at 50% of the cost of admission) if more than 10 of the passes you send out are actually used – the first 10 are free! This makes the book show a great opportunity to get in touch with all of your customers in the area. As usual when the doors opened on Saturday morning, there was a crowd waiting to get in. Sales were brisk during the first few hours of the show, but even the final closing announcement found some buyers still busy with last minute purchases.